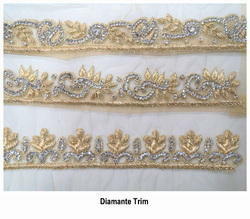 Our product range includes a wide range of fancy diamond cutwork lace, diamante lace and hand embroidered diamante trim. With the help of our advanced infrastructure, we are engaged in offering a wide collection of Fancy Cutwork Lace. The laces provided by us are designed with perfection by using latest designing techniques by our adept and skilled personnel. The offered range is highly demanded for its smooth finish and attractive look. In addition to this, we are providing this range of laces to our clients at the most reasonable rate. 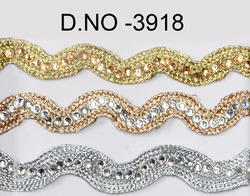 By utilizing skills of our creative designers, we are engaged in offering an interesting collection of Diamante Lace. We design the offered lace using fine quality fabric as per the prevailing market trends. Our offered lace is the choicest amongst similar products available in the market, owing to its fade resistance, attractive look and glossy finish. This lace can be availed from us at an affordable price. With the support of our skilled designers, we are engaged in offering a wide collection of Diamante Lace. By keeping in mind clients varied choices, we offer the entire collection in various designs, styles, colors and patterns. The offered lace is not only designed using utmost-grade fabric but also tested on various parameters of quality. Clients can avail the entire range from us at market leading prices.